I'm trying to take better care of the artillery units and as I was playing the free wargame March to Baghdad, the position area of 1-10 Forward Artillery (FA) during the assault on Tallil airbase caught my eye. 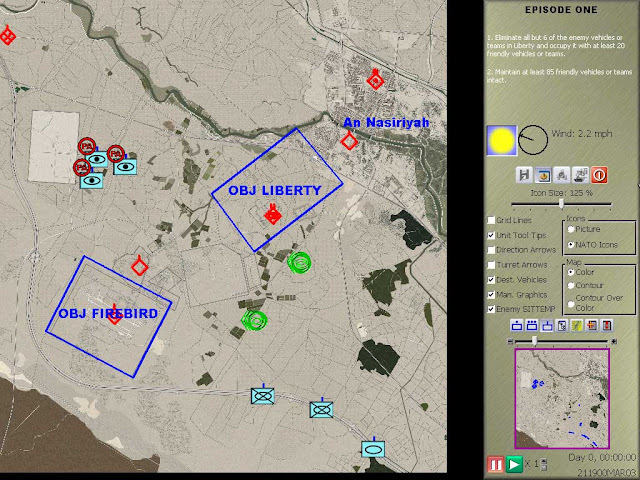 TF 1-15 IN (blue icons in the lower right) is getting ready to assault objective Liberty. 1-10 FA (blue icons in the top left) are already deployed in a position area (PA). We are assaulting from the southeast and the artillery is already positioned past our objectives, in the northwest? The creator of this game engine, Pat Proctor, is an artilleryman and if there is something screwy in his games I am sure is not the artillery part. For starters, the position area of 1-10 FA in the game is true to life. But I am intrigued on how this position area, seemingly so exposed to enemy assault, came to be. The material below is taken from the US Army's semi-official report on the Iraq War named On Point. This book can be purchased in a printed version or downloaded/viewed in the internet. During the Iraq War, the 3rd Infantry Division (ID) was the spearhead of the invasion. It was quite a long ride and it had to be done fast to keep the Iraqis out of balance. Covering so much ground so fast was not easy and there was a big concern about lines of supply. An order that came directly from V Corps to the 3rd ID was to secure the Tallil Air Base in order to have a logistics support area and to prevent Iraqi interdiction of the over extended supply line. 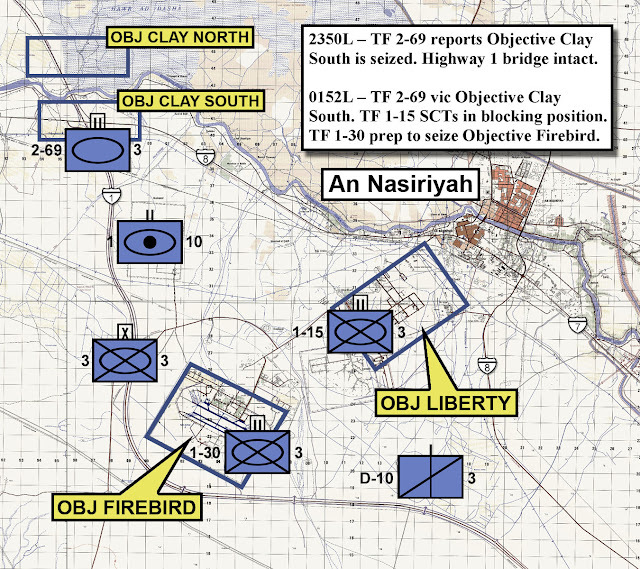 The commander of 3 ID (Maj. Gen. Blount) ordered the 3rd Brigade Combat Team (3-BCT) not only to secure the air base (objective Firebird), but also to secure a crossing over the Eufrates (objective Clay) and to secure the northeastern approaches from An Nasiriyah (objective Liberty). The reasoning behind objective Liberty is that in order to assault an enemy position, it is always desirable to isolate it from reinforcements. Scheme of maneuver for the 3-BCT: TF 2-69 would secure objective Clay, then TF 1-15 would secure objective Liberty and finally TF 1-30 would secure objective Firebird. 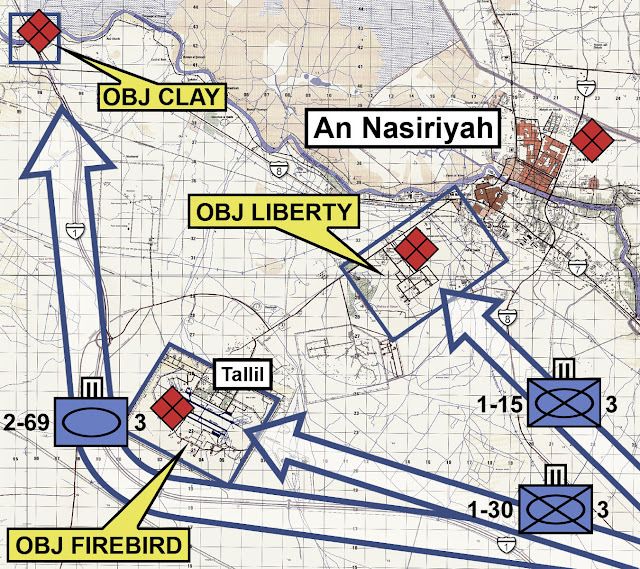 The mission of TF 2-69 killed two birds in one shot: it secured a crossing for the advance towards Baghdad (let's not forget, this was the primary mission of 3-ID) and also served to isolate objective Firebird from Iraqi reinforcements pouring through Route 1. 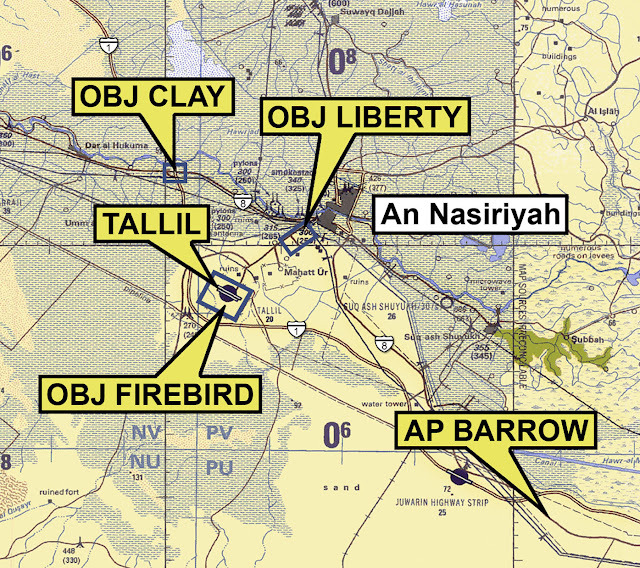 3-BCT had four maneuver battalions (one is not depicted above and was kept as a reserve right until the final assault on the air base) and almost 50% of the forces were devoted to shaping operations (isolating objective Firebird). 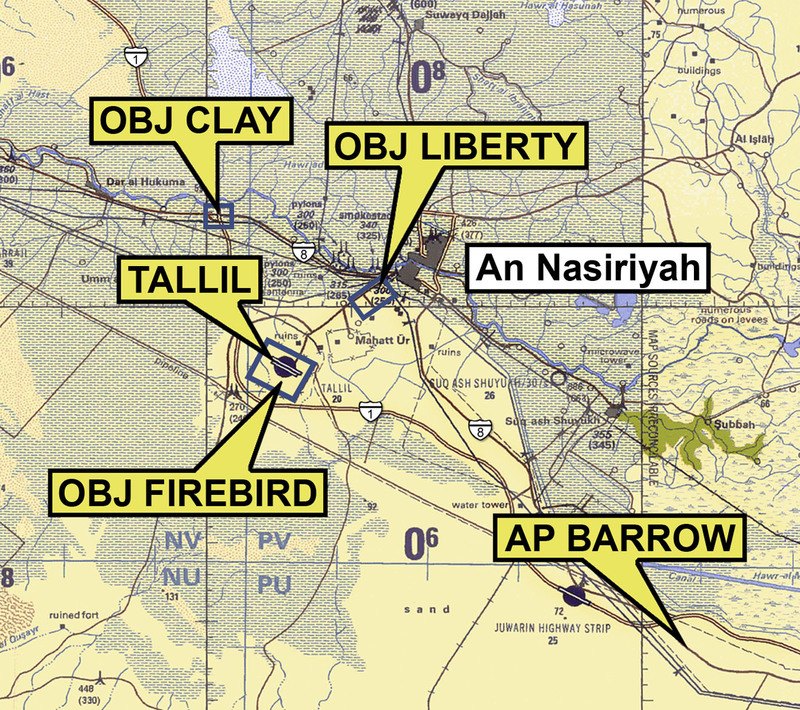 Just 25% of the forces were used in a decisive operation (secure objective Firebird). And finally the answer to the main question of this entry: the position area of 1-10 FA allowed fire support of troops engaged in all 3 objectives. End game at Tallil. Note the position of 1-10 FA: from there it can shoot at any Iraqi bothering to mess with the men of the 3 ID.